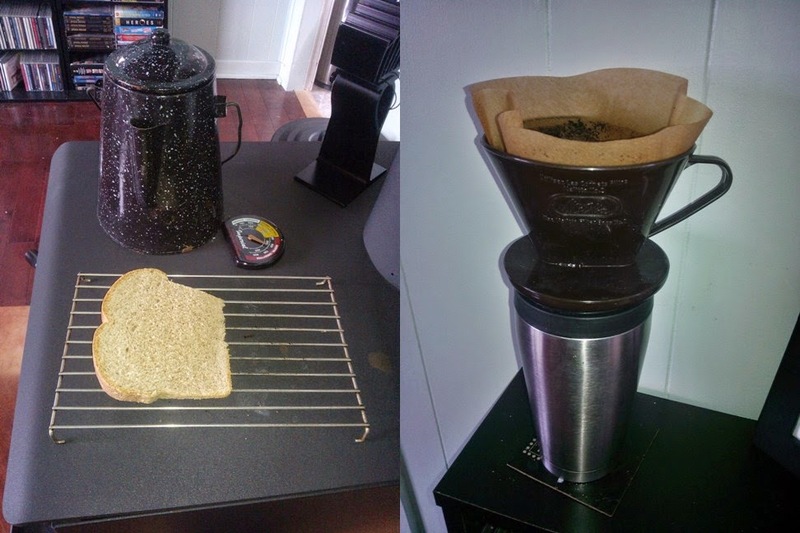 The good, the bad, and the funny. Life is springing up all over the place these days. The vegetables in the garden, the lilacs and lupins blooming, and the hummingbirds are hovering outside my window daily. But, living in the country comes with harsh realities and this week we came face to face with it. Our five chickens: Jessie, Dottie, Joan, Blondie and Marcella, have been gracing us with lots of eggs and providing us with a lot of entertainment. 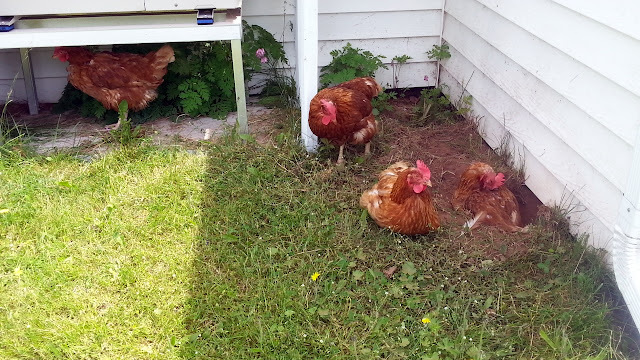 Earlier this week I let them out to free range in the morning as usual but when I went to round them up in the chicken pen for the afternoon while I went out to a job opportunity, only three of my little darlings was to be seen. Blondie and Marcella were missing. They all usually come running when I call and a search for them turned up nothing and so I left to earn some wages. I had hoped when I got back they would be there. One was. Marcella was still missing and so we went to bed that night hoping against hope that she would turn up in the morning. I was told by other chicken owners that it's not uncommon for them to roost in a tree overnight and show up next morning. The sun rose over our little piece of heaven but Marcella was still not to be seen. There was no cluster of feathers or other signs to be found to give us an idea of what happened. We figure a fox grabbed her and ran off. 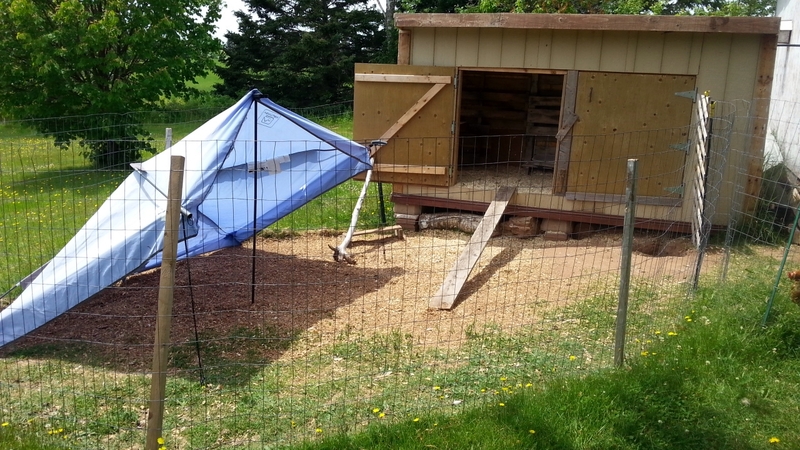 Poor Marcella...rest in peace little hen. And so, we have had a heavy heart all week. The week did have a positive note as well. We finally saw our first seals. It's been a joke among friends here that although they are commonly seen by everyone, we seem to always miss seeing them. We'd rush to a location someone recommended with no success. We started joking that the seals had an informant telling them when we were coming so that they could hide. So we were pleasantly surprised when after delivering a gift to someone, we decided to take a stroll on the beach. The tide was out and we were able to walk quite far out and there it was. A small sandbar sticking up out of the water with at least 30 seals lounging about like a bunch of drunk frat boys after a party. They were making all sorts of noises and rolling around, scratching with those finger like tails. What a sight! We had hoped to get a little closer but one step too close started them sliding off into the water and so we stepped back a bit and just watched them through binoculars and took pictures. One of them, probably an elder, was covered in scars. A record of the dangerous life he leads. 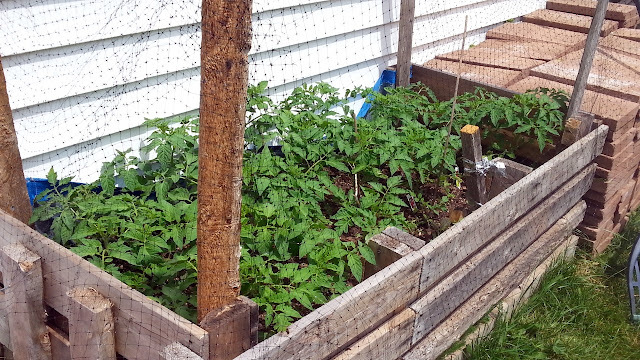 The raised garden beds are finally filled with soil, seeds and seedlings, and with a little bird netting over the top we are on our way to hopefully a good harvest this year. 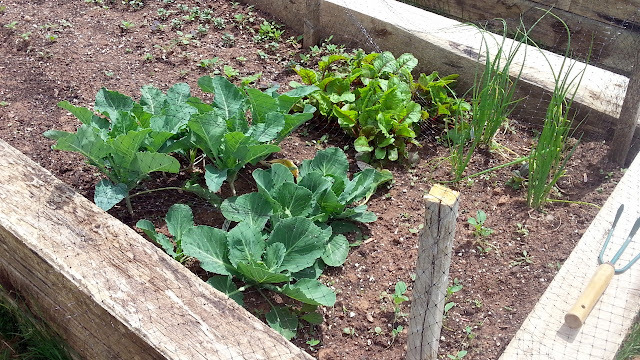 I'm finding it easier to tend them, keep them watered and weeded, now that they are close to the house. What also helps is that the bugs this year seem to be a whole lot more bearable than in previous summers. I'm finally able to hang my laundry on the line and spend a lot more time outdoors Whether it's the chickens eating lots of bugs, the hummingbirds eating lots of bugs, the bug zapper, or the mosquito traps we placed across the backyard, or all of the above. Either way, there seem to be fewer bugs to deal with this year so far and this has made working outside a joy again. To round out the week Keiko managed to capture a squirrel and bring it into the house. After making her drop it the darn thing took off and hid behind my stove. There was some stove moving and poking involved before he managed to slip out and dash into the livingroom. Half an hour later with the living room in a complete shambles with all the furniture moved around, I finally had him trapped in a bucket so I could carry him outside and release him. Never a dull moment around here. And so we had a little joy, a little sadness and a little humour to pepper our days and add spice to our lives. That leaves me with nothing more, but some pictures for you to peruse. 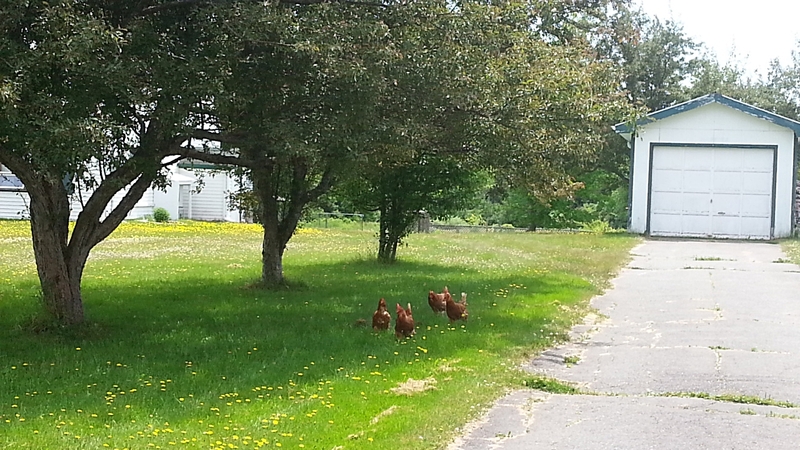 Even when I'm checking the mailbox, my posse is following me. Nothing like dust bathing in a hole in the ground next to the house. 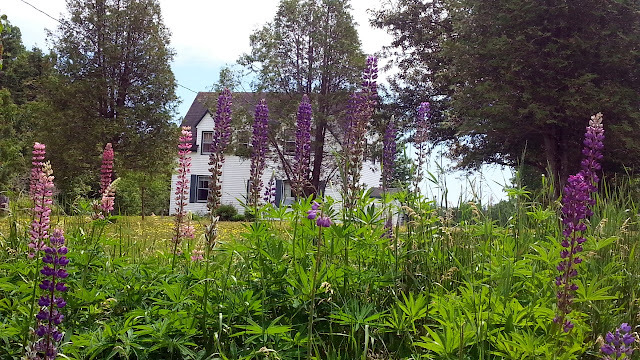 Our own little Anne of Green Gables house as seen through the lupins. 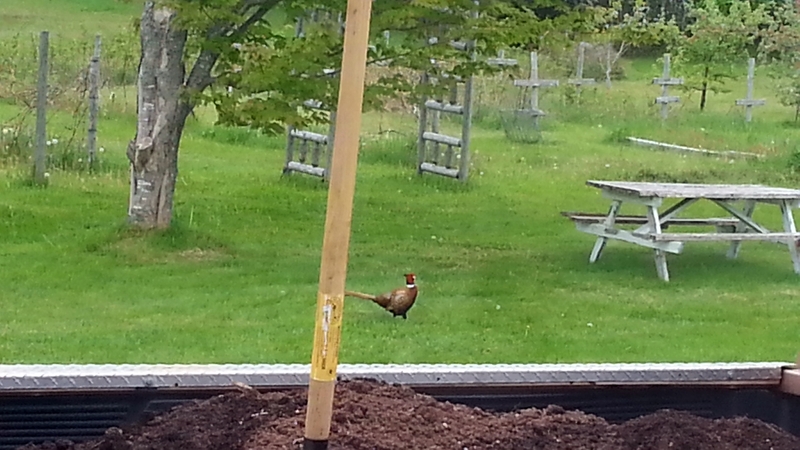 A ring necked pheasant that strolled through several times looking for a mate. 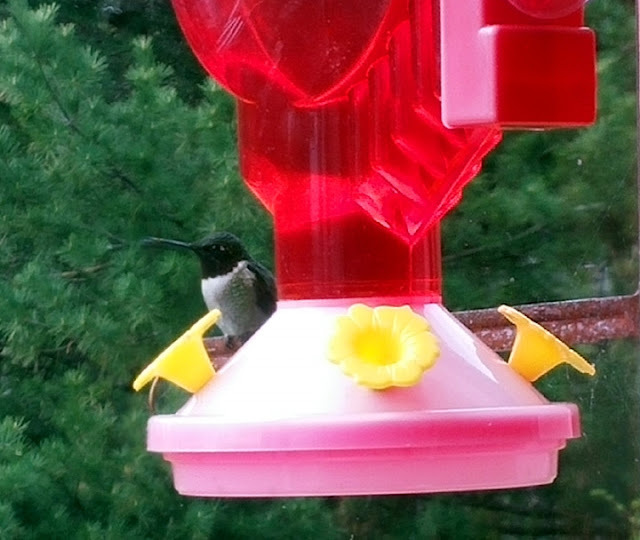 One of the many hummingbirds that visit our feeders every day.